A simple girl looking at the world through her eyes. daughter: Can you get up from my seat. I was shocked at this order and replied: I have a confirmed ticket for this seat. daughter: I just now saw in the sheet outside. My seat has been confirmed from waiting list and its this seat. Me: Well yours was waiting list, mine has been a confirmed one since the last 2 months. daughter: Check your ticket, I have just verified from the list outside. This annoyed me and I replied, “My ticket has been checked and approved by the TTE an hour ago”. This argument continued for sometime where both of us didn’t move from our grounds. Ultimately the girl decided to verify again from outside. She asked her mother to sit on the neighboring seat. The guy on that seat had a confirmed ticket which too was verified by the TTE(Ticket Examiner). “I checked all the tickets here. Your seat is in C7 not C1”. 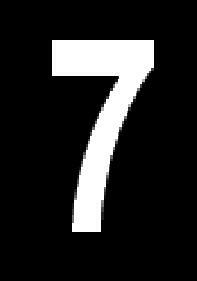 To which the girl replied “Oh is it seven? I thought it was one”. At this, the entire bogie started smilling. The whole confusion occured because the girl had read seven as one. I don’t know about the girl but whenever I get anything with digit 7 or 1, I always doublecheck the digit. People try to avoid the seven star but I try to avoid the seven confusion. The first part was mentioned in the blog https://sanchitahobby.wordpress.com/2014/01/06/shocked-by-a-honk-on-a-lonely-road/. Cop: What are you looking for? Arun: We are looking for a motel but are unable to find one. Cop: Oh! Do one thing, rather than take a turn in the next lane, go straight and take a turn in the lane after next. There you will find many motels and restaurants.